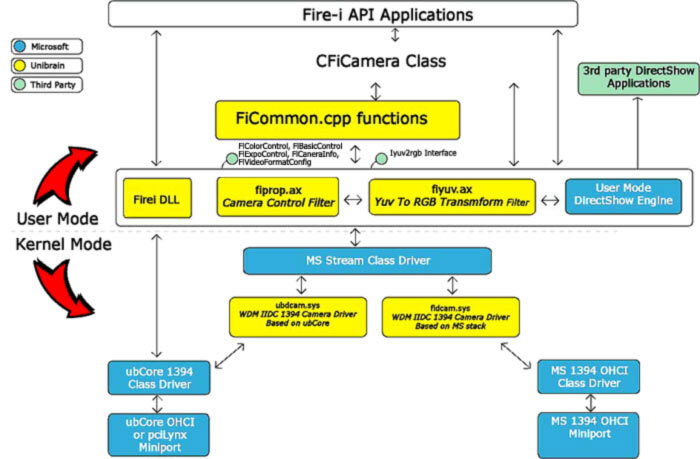 The Fire-i API™ SDK provides developers with all the tools they need in order to develop and debug professional applications for IIDC 1394 Digital Cameras. Fire-i API™ includes in one product both MS Stack driver and ubCore™ 1394 driver based SDKs, allowing the developer to choose the most appropriate tools for his project. Same licensing scheme is valid in both environments. Fire-i™ DLL: User mode C style DLL that directly communicates with the 1394 adapter drivers and provides a simple and robust interface that allows full control and preview of IIDC 1394 digital cameras connected to the adapter. A variety of source samples as well as accompanying documentation for the DLL is provided with Fire-i API™. Codecs: DirectShow and Video For Windows codecs are provided and installed along with the WDM camera drivers. The codecs provide an interface to transform camera transmitted data into various displayable image formats. Conversion of RAW Bayer camera images using various different algorithms is also supported. Object Oriented Camera Class: Fire-i™ API provides both a C++ compatible as well as a .net compatible object oriented class that allows camera enumeration control and preview in just a few lines of code. The FULL source code for both classes is available as a source sample. ActiveX and .NET controls: Fire-i™ API includes the Fire-i X™ SDK with its native ActiveX and .NET classes interfacing directly with any ActiveX or .NET compliant programming language. Detailed documentation and samples: Fire-i™ API comes with a detailed documentation and a big variety of samples. The complete source code of Fire-i software is even included to easy and simplify development time substantially. IIDC 1.31 compliant, support for IIDC 1.32 draft features. DirectShow based drivers, WIA compatible. Payload sharing between several computers. Full user-configurable 16 bits support. Full set of functions for display and storage of frames and live video in any encoding format. TCP streaming in less than 5 lines of code. Support for control by absolute values. Support of any format (Format_7). Software Multi-DMA isochronous channel functionality, eliminates limitations of number of cameras that can operate in the same adapter. Download a white paper regarding Multi-DMA feature, from here. Support for large isochronous packets on 1394b cameras. Read more details here. Note: In order for Labview to support WDM drivers (and our drivers), a separate SDK (IVision) has to be installed. Specific drivers for industrial models of Unibrain, AVT, Basler, Baumer, Cyberoptics, Hamamatsu, ISG, Hitachi, PixeLink, PointGrey, Sony, Teli, Victor etc. Windows XP/2003-8 Server/Vista/7/8, 32 bit and 64 bit. 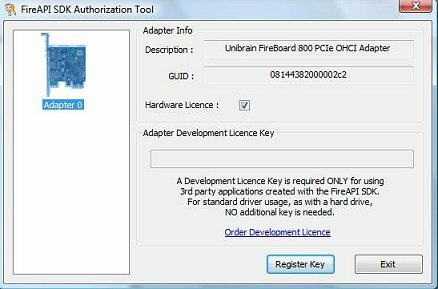 Fire-i API™ operates with Unibrain’s or any third party 1394a or 1394b OHCI PCI/PCMCIA compliant adapter, or any Desktop/Portable PC with built-in firewire support. 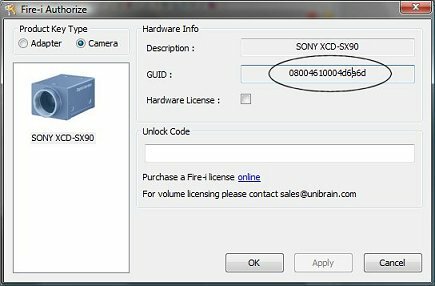 For non-Unibrain cameras, permanent operation requires the use of a Product Key or a Hardware License hosted in a Unibrain adapter. Fire-i API™ Header and Lib files. Fire-i™ application (also available as a separate product) to control, display and capture any compliant camera. Great variety of source samples, including full source code of Fire-i™ application. Three months of free development support. For further information about licensing, please refer here. Added: support for DAP Technology S1600 standard and Sony S1600 cameras. Added: ReadBlock and WriteBlock methods in Firei.NET(X) API (Firei.net.dll). Fixed: Unintended frame skip when using Snapshot button (Fire-i app). Added event for getting full frame buffer access in Fire-i X SDK. Added Call for pulling software trigger in Fire-i X SDK. Added option for desired time of video recording. WHQL certified IIDC camera driver for Windows XP/Vista/7. Added support for Unibrain Fire-i 980 5 Mpixel 1394b camera. Fixed: Problems with saving frames from Little-Endian cameras. Added: Support for Windows 7, 32/64 bit. Added: FrameCapture dialog – select frames to skip instead of time intervals. Fixed: Fire-i application now remembers the last selected RAW mode conversion for a camera. Added: Support for new Unibrain 1394b cameras. Fixed: Directshow video image disrupted after standby-resume. Fixed: YMONO_16 little endian conversion occurs in kernel mode. Added: Add FiGetLUT and FiSetLUT functions for LUT functionality for Unibrain industrial cameras. Fixed: Various issues with audio compressors when capturing video. FiConvertToRGB24 does conversion to BGR instead of RGB. System Crash when selecting Raw-8 format in Fire-i Application. Added: RAW mode support and Format-7 color codings in Firei.dll. Added: DMA channel multiplexing at the driver level, completely transparent to user mode (Fire-i ubCore only). Added: support for AVT Pike ‘jumbo packets’ mode, PointGrey Grasshoper ‘dual packet’ mode. Read more information here. Added: support for new Sony 1394b cameras. Added support for Visual Studio 2008, Microsoft Platfordm SDK 6.0 and latest revision of DirectX SDK. Fixed: Fire-i application fails on “Install Fire-i Drivers” menu item. Fixed: Fire-i Application – Max Region button does not restore max F7 packet size. Added: IIDC driver automatically breaks image isochronous requests according to system DMA limit. Fixed: IIDC driver sets initial max packet size for Format-7 correctly. Added: Fire-i application can display the camera’s configuration ROM as a tree. Added: Fire-i application now saves/loads correctly to/from camera memory presets and/or the registry, as well as to/from XML files. Fixed: Capturing video with compression does not hang fire-i application while “copying capture file”. Fixed: Auto installation of drivers now works correctly. Added: New FPS Stamp setting, that displays the current FPS reading on the video window of a camera. It has similar options to the TimeStamp feature. Added TIFF-16 mono frame capture file format. Added full support for Windows XP/2003 64 bit (via separate installation build). Added dual 32-bit/64-bit filter support on x64 platforms. live image stream or captured frame/video, which is removed when the drivers are licensed. Fixed error “fail to enumerate capture driver” occurring with various cameras. Added support for controlling more than 32 cameras in Fire-i application and CFiCamera class. Added support for AVT Pike, 1394b cameras. CFiCamera and FiCommon static libraries converted to DLLs. MFiCamera converted to Visual Studio 2005 syntax. Projects provided (ready) for VC++ 6.0, Visual Studio 2003, Visual Studio 2005. Added support for all new 1394b (Firewire-800) cameras. 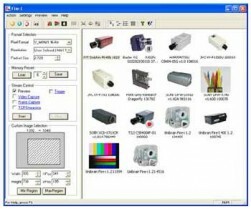 Added support for new Unibrain firewire industrial cameras. The new ubCore IIDC camera kernel driver (ubdcam.sys) is WDM & DirectShow compliant. The Fire-i application has been ported under ubCore and the full source code is provided. New licensing scheme: A unique software license is associated per camera or firewire adapter. Added Configuration Property pages for the fiyuv.dll “Video For Windows” codec. The configuration dialog allows to enable and setup raw mode conversion as well as other conversion options for usage with 3rd party applications. Added support for Microsoft Visual Studio 2005. Fire-i™ ubCore DLL is now included in Fire-i™ API. Fire-i™ ubCore DLL exports a set of camera control and display functions and is based on Unibrain ubCore 1394 driver stack. Along with it the latest version of the ubCore drivers, which is needed by Fire-i™ ubCore DLL, is included in Fire-i™ API. The full source code of the Fire-i™ application is now included. Full Y Mono 16 bit display and capture support. Big parts of the Fire-i™ API source code are now moved into static libraries that can be linked with a project instead of including the whole source code into it. Precompiled versions of all the Fire-i™ API libraries are now provided. This simplifies the task of getting started and working with Fire-i™ API and the DirectShow SDK. Still Frame Capture is now possible using other formats than RGB 24. The user is now able to use any codec provided by the system in order to capture still frames. The default codecs included in most systems include jpg, gif, tiff and many other options. XML files can be used in order to describe a DirectShow filter graph with distinct filter connections. Methods are provided by the Fire-i™ API libraries that build a DirectShow filter graph given an XML file. Methods that allow block reads and writes in the camera address space are now provided. New structures and enumerations are included that allow full control and configuration of the trigger register. Methods are provided that allow the user to setup the current trigger polarity, the current trigger mode and all the other capabilities provided by a trigger register. New headers are provided that contain structures specific to the manipulation of every camera register defined by the IIDC specification. Fire-i™ Application is a full blown explorer like camera control and preview application. The Fire-i™ application demonstrates just about every functionality offered by the Fire-i™ API and can be used as a basis for any type of customer application. Locking mechanism. Now a range of HASP dongle keys provides functionality in different levels according to user needs. This allows the developer to downsize the license price of according to final application specs. TCP Streaming support. TCP support through windows media video architecture has been added. Y Mono 16 bit support. Functionality to both acquire and display Y Mono 16 bit formats has been added to the Fire-i™ API. Raw mode display support. 4 different raw mode conversion methods have been added to the Fire-i™ API YUV to RGB conversion filters. The user can acquire a raw Bayer image from the camera in Y Mono format and use Fire-i™ API in order to convert and display the data in color in real time. Support for multiple Format_7 modes has been added. Previously only the first one was recognized. .net support has been added with availability of a managed camera control and image acquisition class. Furthermore the class is open source so that the user can modify it to fit her needs. Direct support added for many camera models. Compared to Generic Support, this handles vendor specific corrections and convenient model icon display. The driver property pages for the exposure controls now display absolute control values instead of meaningless numbers read from the camera. e.g. Shutter is displayed in ms or us depending on the current value. FiCamera serves as a wrapper to the CFiCamera class and provides functionality of the Fire-i™ API library through .net compliant languages. Writing Fire-i™ API applications with VB.net and C# is as easy now as it was with C++. Format 7 (Partial Scan) support. Support for user defined scalable formats is added to the driver and is exposed to the user mode developer through new interfaces. WIA support. The Fire-i™ Drivers support the new Windows Image Acquisition API provided by Microsoft in Windows XP and Windows Me. TWAIN support. Through WIA support in the Fire-i™ Drivers TWAIN support is also added since the WIA API implements a thin layer of compatibility for TWAIN drivers. Support of Windows Me, 2000, XP, not of 98SE. FiVideoFormatConfig provides methods to query the camera formats and set-up the camera in a specific format. This interface provides methods to set-up a camera in Format 7 and also provides a property page that allows camera format set-up from 3rd party applications. FiExpoControl interface. New methods were added into this interface in order to be able to compute the absolute value of some camera exposure control like shutter and gain. Cficamera serves as an abstraction layer to DirectShow and the Fire-i API™ provided extension interfaces. Programming Fire-i API™ with this class makes things a lot simpler and it is highly recommended. The CFiCamera class makes extensive usage of the ficommon.cpp source file. Multigrabber allows grabbing of frame samples from multiple cameras. This sample makes extensive usage of the ficommon.cpp source file. CamControl is a simple console mode application that allows the control with simple commands of the camera features like gain, brightness, focus etc. This sample makes extensive usage of the ficommon.cpp source file. ConsoleGrabber is a simple console mode application that uses the CfiCamera Class in order to start the first camera found on the bus and save camera frames on user demand. ficommon.cpp. This is a source file that is located in the samples directory and contains over 60 utility functions. This source file is included in the Fire-i API™ samples and can be included in any customer application. Located in ficommon.cpp the user will find a variety of utility functions that handle many of the complexities of DirectShow and COM interface programming. Three new OIDs were added: OID_CAMERA_NODE_ID, OID_PARENT_PHYSICAL_PORT and OID_CAMERA_SERIAL_NUMBER. Added a new parameter to FiCreateDisplayWindow so that the caller can choose if hardware overlays are going to be used or not. Changed the Fire-i sample application. The Fire-i sample is now comprised of one executable that handles both the control of the camera and the display of the frames. Reading camera capabilities improved. FiOpenCameraHandle burdens less the camera with asynchronous transactions. Support of SONY XCD-X700, XCD-SX900, DFW-X700 & DFW-SX900 digital cameras. First official release of Fire-i SDK and drivers.